Mobikwik is an online Recharge website, you can easily Recharge your Mobile DTH, Data Cards, Bill Payments. Now Get Rs 50 Cashback on adding Rs 50 to your Mobikwik wallet, Offer valid for new users only. Note:- Offer only works when you use New debit / credit card with New device with Verification only. How To Get Rs 50 Cashback on adding Rs 50 to Mobikwik wallet? • That's it! You will get the Extra Rs 50 Cashback in your Mobikwik wallet instantly. 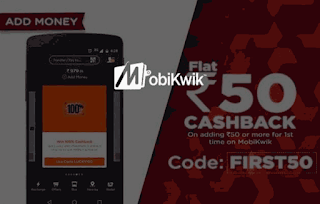 - Get flat Rs 50 Cashback on Add Money of Rs 50 or more done on MobiKwik App. - Maximum Cashback amount is fixed at Rs 50. - Coupon redemption & Payment should be done on MobiKwik’s Android, Windows & iOS App. - Offer can be redeemed only ONCE per user during the offer period. - Offer valid for NEW MobiKwik users. - The offer is not valid on Net Banking and Virtual Card payments.